Dull with heavy showers for much of the day. This is the larva of the Broom Moth - Ceramica pisi. It appears to be a polyphage: I've found it feeding on many different plants. 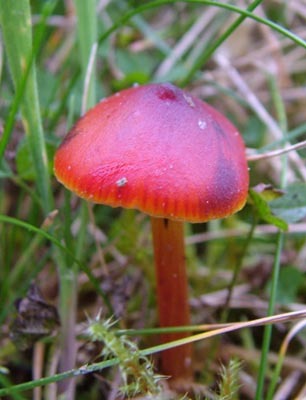 This is another shot of a mature Blackening Waxcap - Hygrocybe nigrescens. About 2 cm. across the cap. Fine colour. There's a new pond that was created during the forestry clearance 3 years ago. It is about 40 cm. deep in the centre and has begun to assemble a reasonable amount of plant life. Juncus and Callitriche are quite prominent, along with some recent Bog Pondweed. Toads have been spawning for 3 years, and I've seen various water beetles and Water Boatmen rummaging around. The nutrients are still on the low side, since I saw Toad tadpoles in there today: That usually means a lack of iodine in the water. As more and more species arrive it will be interesting to watch the pond maturing. I noticed this larval case of the Great Diving Beetle floating at the edge of the water, and closer inspection revealed the Great Diving Beetle on the right. I wonder if it was newly emerged. Another splash of colour - the Heath Milkwort has flowered again. This appears to be one of the Myxomycetes - a rudimentary fungus - on a fallen branch. The Toad Rush - Juncus bufonia - is very difficult to photograph. This clump at the edge of the pond offered the chance to get something in focus.